Adult formula is made with organic free-range turkey as the first ingredient for animal sourced protein to support healthy muscles. Packed with wholesome brown rice and cranberries, plus essential vitamins, minerals and taurine to support healthy eyes and a healthy heart. 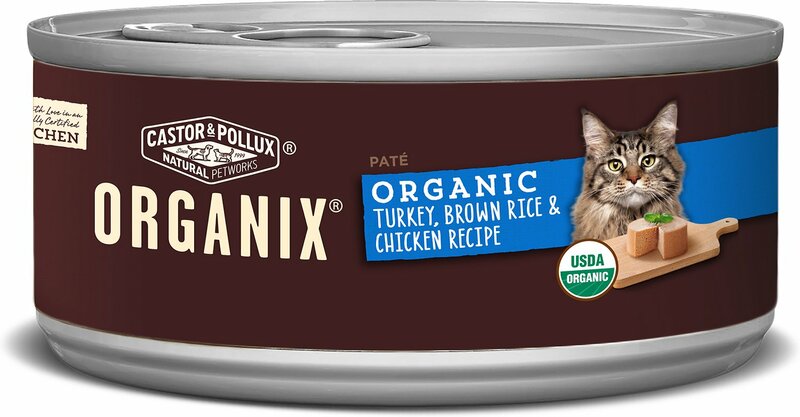 Contains omega-3 and 6 fatty acids to nourish skin and fur, with zero corn, soy, or wheat so it’s great for kitties with sensitivities or food allergies. Supports digestive and urinary health by providing adequate hydration from real, tasty broth in every can. Organic Turkey, Water Sufficient for Processing, Organic Brown Rice, Organic Chicken, Organic Chicken Liver, Organic Coconut Flour, Organic Dried Egg Product, Organic Flaxseed, Organic Cranberries, Calcium Carbonate, Salt, Potassium Chloride, Choline Chloride, Organic Guar Gum, Minerals (Zinc Amino Acid Complex, Iron Amino Acid Complex, Copper Amino Acid Complex, Manganese Amino Acid Complex, Sodium Selenite, Calcium Iodate), Vitamins (Niacin, Vitamin E Supplement, Vitamin A Supplement, Thiamine Mononitrate, Pyridoxine Hydrochloride, Riboflavin Supplement, d-Calcium Pantothenate, Vitamin D3 Supplement, Biotin, Vitamin B12 Supplement, Folic Acid), Taurine, Tricalcium Phosphate. 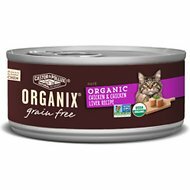 3 oz Can: Feed your Adult cat about 1 can per 6 - 8 lbs of body weight per day. 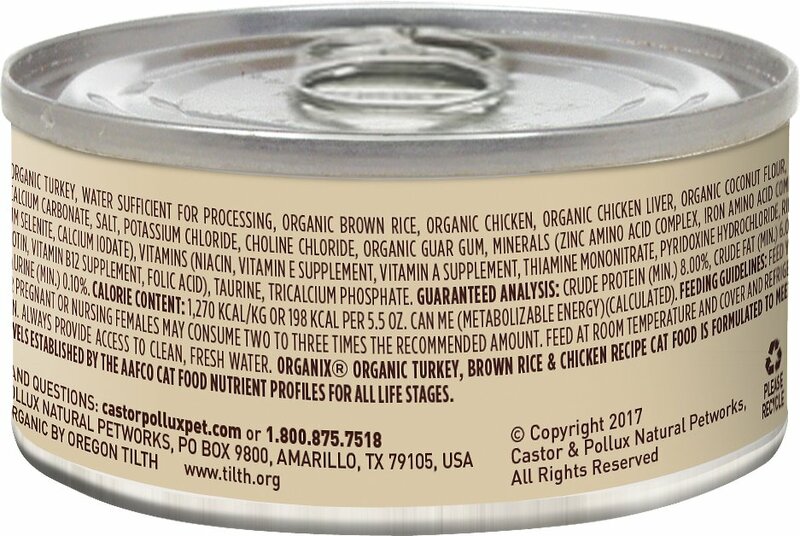 5 oz Cans: Feed your Adult cat about 1/2 can per 6 - 8 lbs of body weight per day. My calico cat has food issues w/her stomach and allergies. She's been on this and the Org Chicken, Castor & Pollox for 1.5 yrs now and she's so much better! I add probiotics to her food and she keeps it down and loves mealtimes now. What a difference! No wonder she was so grumpy before because she wasn't feeling well but she's all better now! It does have a slight brown rice smell to it. When I first opened it up I was immediately doubtful of its success. First time in her plate was a no toucher. No bites. Second time--a few days later was an entire can all gobbled up in no time flat, licked her plate clean! She had NOT taken to some of the very expensive food out there I got for her NO MATTER how many times I've tried. This was a success only the second try. Give it time. 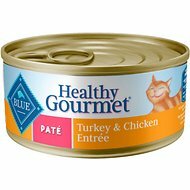 Healthy wet food and all 3 of my cats like it, I highly recommend it. My Cats won't eat it. I buy healthy food for my cats and they love most of the brands I buy. They don't like the Castor & Pollux Turkey, Chicken and Rice. Most of it is left in the bowl. I have 4 cats and not one of them liked the food. I have thought about returning the food, but I think I will donate to a feline rescue. Healthy ingredients but my cats (6) out of 8 don't want to eat it! The other two pick at it. Too bad.